WILSON, Addison Graves (Joe), a Representative from South Carolina; born in Charleston, S.C., July 31, 1947; graduated from the High School of Charleston, Charleston, S.C.; B.A., Washington and Lee University, Lexington, Va., 1969; J.D., University of South Carolina, Columbia, S.C., 1972; United States Army Reserve, 1972-1975; South Carolina Army National Guard, 1975-2003; lawyer, private practice; deputy general counsel, United States Department of Energy, 1981-1982; staff, United States Senator Strom Thurmond of South Carolina; staff, United States Representative Floyd Spence of South Carolina; member of the South Carolina state senate, 1984-2001; elected as a Republican to the One Hundred Seventh Congress, by special election, to fill the vacancy caused by the death of United States Representative Floyd Spence, and reelected to the nine succeeding Congresses (December 18, 2001-present). Papers: The Addison Wilson papers are not yet open to researchers. 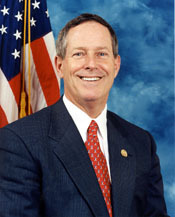 The collection is expected to document Wilson's service as a state senator for 17 years, as well as his Congressional service, which began in 2002.